At a time when brands, their agencies and their media trading partners are embracing content marketing as a logical solution for brands to reach consumers in a “post-advertising” world, some highly regarded research indicates they are mostly failing. 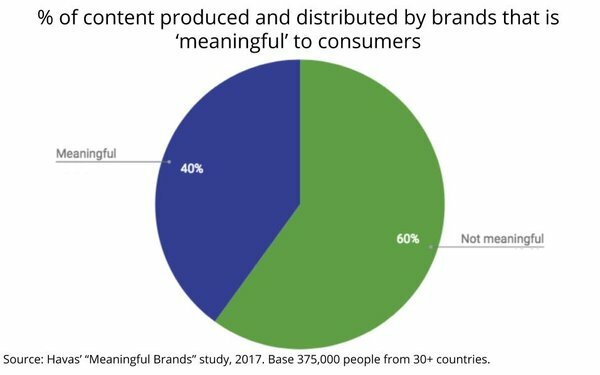 As part of its ongoing, global “Meaningful Brands” study, Havas began asking consumers how much of the content they see from brands is actually relevant and meaningful to them. “Sixty percent of the the content brands are producing is not meaningful to consumers,” says Maria Garrido, global chief insights- analytics officer of Havas and senior vice president-marketing investing at parent, entertainment giant Vivendi. As part of Havas’ restructuring, following its acquisition by Vivendi last year, Garrido says Havas added the content question to its Meaningful Brands study, which is currently in the field again. The findings for the U.S., the U.K. and France will be released this fall, and the global findings will be released in January, but Garrido is already willing to make a prediction. 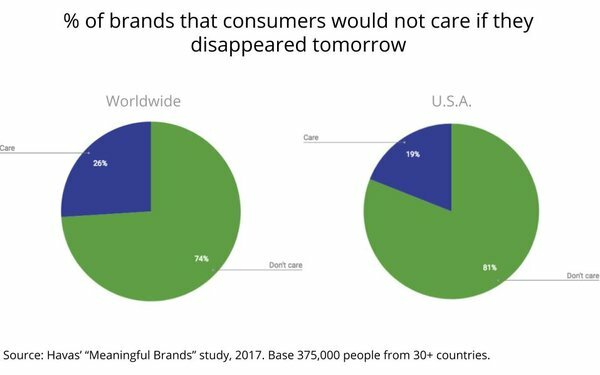 “The number of brands that can disappear is going to be worse,” she says, referring to the most essential question Havas has been asking consumers worldwide for more than a decade: If a brand goes away tomorrow, would they even care? Based on its last study, fielded in October 2017, 74% of brands could disappear worldwide. In the U.S., it was 81%. The reason the U.S. consistently has a higher percentage, is because there are more brand choices available to American consumers than in other markets worldwide. While the brand dispensability question has been the core of Havas’ “Meaningful Brands” study, Garrido said it has effectively been rebooted and enhanced to understand the role that content plays in creating meaningful bonds with consumers -- or not. She acknowledges the shift is partly attributable to the fact that Havas is now owned by an entertainment and media giant Vivendi, which can and does provide a variety of content solutions for brands. But she says the goal genuinely is to understand the role that content of all kinds plays in reinforcing bonds between consumers and brands. Importantly, she says it varies by brand, consumer and category -- and one form of content clearly does not fit all situations. “If you take the healthcare sector, consumers have an expectation that first and foremost, the content should be about helping them. And the second thing is it should be about informing them,” she explains, adding that the content developed and distributed by brands needs to reinforce and fulfill those expectations. That doesn’t necessarily mean the content has to be purely utilitarian, she says, giving an example of “entertainment” content that could fulfill a healthcare brand’s need to create a meaningful bond with consumers. “We might develop a music app that helps people with their exercise and workout activity and helps them track how they’re doing,” she offers. Havas parent Vivendi is a leader in musical content, including the Universal Music Group. And that group even has its own content-marketing solution for brands: Universal Music and Brands. But that doesn’t necessarily mean Havas agencies would recommend using it as a solution for one of their agency clients. The goal she says, is to understand the role that content plays in brand marketing and make recommendations, including Vivendi’s portfolio companies, when appropriate. Conversely, Garrido supports Vivendi corporately and can help Universal Music and Brands develop their own solutions independent of Havas’ agencies. “They are like an internal agency that develops solutions for brands,” she says. As part of the diversification of its meaningful research into content, Garrido says Havas has developed unique proprietary taxonomy for which types of content create which kind of meaning for various brands and categories, and she says they are developing methodologies for executing it. She also acknowledges it’s important that Havas and its clients need to continue to think media neutral about their marketing solutions, and that brand content isn’t always the best solution.